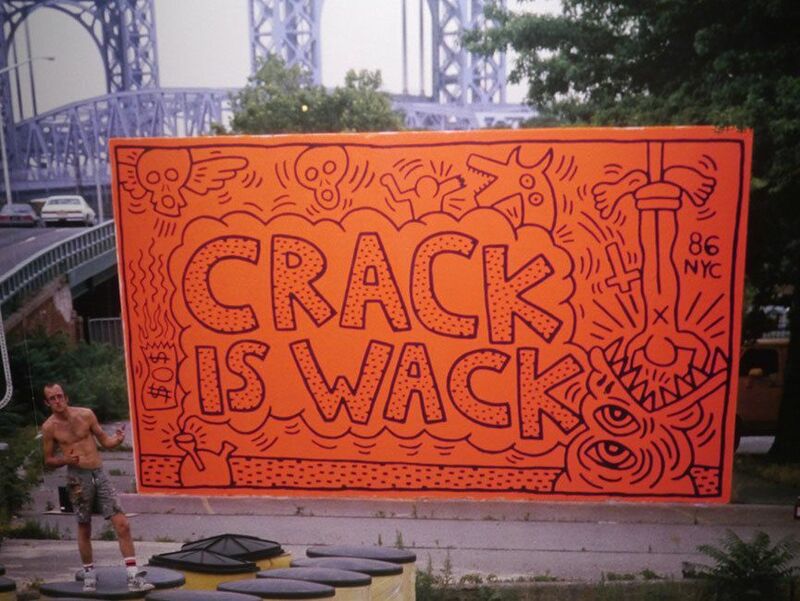 Crack Is Wack is arguably known as Keith Haring’s most legendary work and the most iconic mural in New York City. The double-sided mural’s location in Manhattan on 128th street, next to the incessant passing of cars on Harlem River Drive, possibly plays a huge role in this, gathering more daily views than any other mural in the city. After nearly three decades, what remains more fascinating is the lesser-known story behind the mural pictured above, especially since it isn’t the current version on display in the playground. Haring’s young, gifted studio assistant, Benny, became addicted to crack, inspiring the famed graffiti artist to paint the mural after many failed attempts from Haring’s studio to help Benny curb his addiction without insurance or hospital assistance. Haring, who often drove by an abandoned handball court in a park near Harlem River Drive, decided to use the court’s wall to display his frustrations with an ineffective government on tackling drug-related issues. But as Haring and his team began wrapping up, one policeman stopped the crew and arrested Haring after learning he illegally painted on the wall. The artist then found himself with a hefty fine and potentially facing jail time. Fortunately, the mural’s unexpected popularity saved him in the end. At the time, crack was a major, national issue and the mural’s message resonated with many, particularly the media who often showed his mural when the topic was discussed. This positive publicity reduced Haring’s fine to $100 and resulted in zero jail time. Haring’s freedom was spared, but his mural wasn’t. A vandal had defaced the painting, transforming it into a pro-crack mural. The mural was then painted over in gray by a “”busy bee in the Parks Department,” according to Haring. The Parks Department commissioner immediately asked Haring to paint a new mural with his department’s assistance. This led to the Crack Is Wack mural we recognize today. With the exception of restoration work in 2007, the painting has remained pretty much untouched. The park was also officially renamed the “Crack Is Wack Playground” following Haring’s premature death due to AIDS-related illnesses. The Crack Is Wack mural is a lasting reminder of Haring’s legacy and political activism, continuing to educate and inspire those who come across the compelling painting.